Video: Carl Sagan - Who speaks for Earth? Hans Rosling is a Swedish medical doctor, academic, statistician and public speaker. He is Professor of International Health at Karolinska Institute and co-founder and chairman of the Gapminder Foundation, which developed the Trendalyzer software system. In this talk 'Don't Panic - The Truth About Population' he comprehensively dispels the Human overpopulation myth which has been introduced into the subconscious mind of viewers of mainstream broadcasted media communications over the past thirty years. Whilst the information in this video is credible, remain vigilant with respect to individuals because other viewpoints held by them might not be. I woke up at 6 am this morning, three hours before I’m supposed to be in the office, and was still 10 minutes late to work. This is pretty standard for me. I’m almost always a few minutes late. I don’t mean anything by it, and I certainly don’t think I deserve a different set of rules than everyone else — it’s just the way I am. I’ll look at the clock and think, “Oh, I still have plenty of time.” One or two tasks later, I’ve only got 40 minutes to get to work and a 45 minute commute. This has been the case with every single job I’ve ever had and is typically true when it comes to social meetings as well. I’m habitually unpunctual, and apparently I’m not alone. 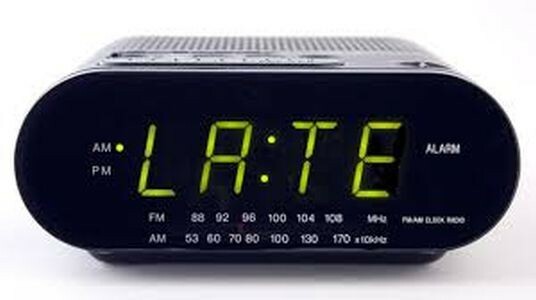 Most late people have been late all their life, and they are late for every type of activity — good or bad. So if you’re chronically late, I feel for you and sympathize with the onslaught of criticism you likely receive on a consistent basis. I know you’re not a lazy, unproductive, inconsiderate or entitled person. I know you’re not attempting to insult anyone by your tardiness. Your lateness is simply a consequence of your psychology and personality — nothing more, nothing less. Speech: Christopher Ryan - Are we designed to be sexual omnivores? Dr Peter Lovatt is an academic Psychologist and a Dancer. Dr Peter Lovatt is a Reader in Psychology and a Principal lecturer at the University of Hertfordshire, where he heads the Dance Psychology Lab. Before starting on an academic career Peter was a professional dancer. Peter studied Theatre and Creative Arts at East Herts College before training in dance and musical theatre at the Guildford School of Acting. Peter was trained in Cecchetti ballet (Angela Hardcastle) and National dance and Pas de Deux (Robert Harold). Peter also studied jazz, tap, historical and contemporary dance. After graduating Peter worked in most of the UK's number 1 theatres and on the international dance circuit. He was a member of George Mitchell's Minstrel Show, worked with choreographer Ray Cornell, and performed in panto at Richmond Theatre. Peter left full time theatre to study Psychology and English at Roehampton Institute, and graduated from the University of Surrey. He then took an MSc in Neural Computation from the Centre for Cognitive and Computational Neurosciences at the University of Stirling (funded by a SERC scholarship), and did his doctoral research in the department of Psychology at Essex University (funded by a University Teaching Fellowship). In 1998 Peter joined the Research Centre for English and Applied Linguistics, at Cambridge University, as a Senior Research Psychologist. After a spell in industry, as a Principal Research Scientist for a speech-based R&D company, he joined Kingston University, where he was the co-ordinator of the Psychology Research Unit and Deputy Head of the School of Social Sciences. Peter joined the School of Psychology at Hertfordshire in September 2004.